Low conversion rate means something on your Shopify store is not working as expected. This makes people leave your site without buying. While you can spot bugs by checking your site on your smartphone, you still don’t know which step of your shopping funnel scares people away the most. From the graphic above we can see that 56% don’t even look at a product page. If we want more people down the funnel, we’ll have to fix this. Lack of product views means the problem is either on the home or collection pages. Now we can focus and analyze these pages in detail. The scope of the search is narrowed down—that’s a small CRO win! How to Access The Shopping Behavior Report so I Can See Where My Funnel is Leaking? Open Google Analytics and scroll to the bottom of the left menu until you see Conversions. Click on it and go to E-commerce, Shopping Behavior. Does your left-hand menu look like this? 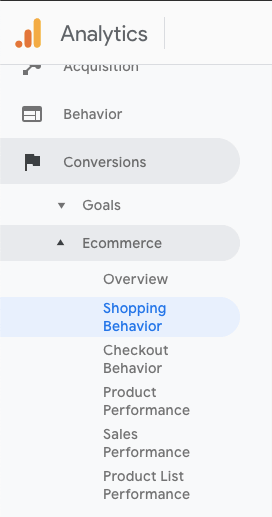 If so, you need to enable “Enhanced Ecommerce Reporting” to get the “Shopping Behavior” report.